Welcome to Adjust To Wellness Family Chiropractic ! Chiropractic patients have great success finding relief from different symptoms such as: back pain, neck tension, headaches, migraines, arthritis, sciatica, pain between the shoulder blades, sport injury, and numbness just to name a few. The reason Dr. Jessica is so passionate about her work is because her patients notice a quality of life improvement once under care. Are you ready to get started and feel better then you ever have? 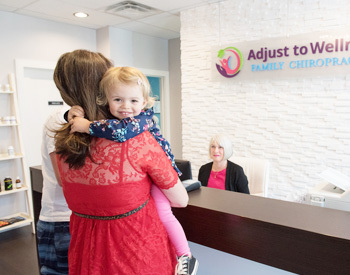 We are so glad that you chose Adjust to Wellness Family Chiropractic! Our first goal is to welcome you in the practice and make you feel comfortable. Dr. Jessica wants to get to know you and truly understand your health goals and your need for care. The expected time for your first visit will be 45 minutes. When you first arrive you will be greeted by a friendly face at the front desk. The chiropractic assistant will ask you to fill out the new patient paperwork which includes questions about you and your health. After filling out the paperwork, Dr. Jessica will get started with her thorough chiropractic evaluation. She will start with the insight millennium thermal scan that shows us a closer look into your spinal health. The doctor will also go over a consultation and history of health concerns and goals. She will perform a complete physical examination which includes postural, neurological, orthopedic and chiropractic testing. Dr. Jessica will determine your need for an X-RAY and she might give you an X-RAY prescription. After completing her chiropractic evaluation Dr. Jessica will tell you if she can help you with chiropractic. She will then invite you to book your second visit called the report of findings. Your report of findings is the most important visit at the office because the doctor has the opportunity to review the results of your chiropractic evaluation with you and give you her best recommendation for care. Regular visit consists of chiropractic adjustments and require only a few highly-focused minutes. Every adjustment builds on the ones before and each adjustment is an important step in your recovery. Dr. Jessica will set up an adjustment schedule for you so that you can heal and achieve your health goals. The consistency and the frequency of your adjustments will determine your chiropractic success. Are you ready to get started? Schedule your first visit and then fill out your paperwork ahead of time! We can’t wait to show you how great you can feel.